Extra Interlocking Thick concrete panels for long life. 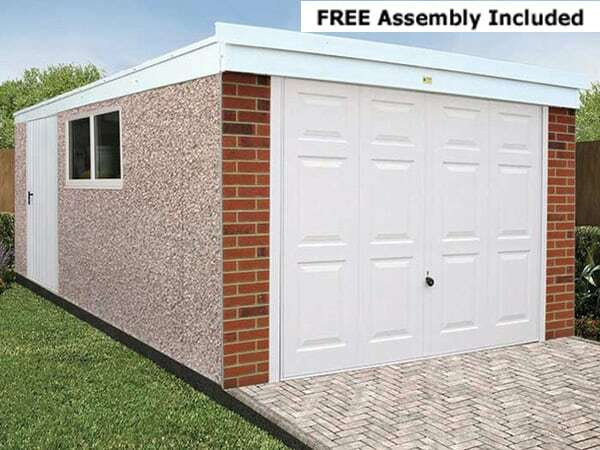 FREE Assembly of Concrete Garages. Cladding – Spar or Brick, Stone or Textured. Pent, Lean-To, Flat Roof or Apex To suit. These Concrete Garages are made in the UK. 2.21m (7ft 3in) Height. EXTRA Height Option. FREE Installation of These Prefab Garages. These Pent Prefabricated Garages are British Made. FREE Assembly of Pent Concrete Garages. Optional Brick, Stone or Textured Cladding. Spar or Optional Brick, Stone or Textured Cladding. Choice of Cladding. Spar or OPTIONAL Brick, Stone or Textured.